Win! 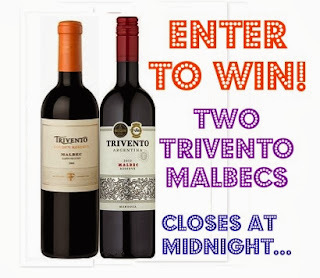 Two Bottles of Argentine Malbec from Trivento! As we roll into Day 3 of our Christmas Giveaway week, we are feeling very jolly indeed. Toasted Glass' martini glasses really caused a stir yesterday (scroll to the bottle of this post to find out if you were the oh-so lucky winner!) but guess what time it is? TIME TO THROW MORE BOOZE AT YOU, THAT'S WHAT! And not just any booze, oh no. We have been given two special bottles from one of our favourite wine discoveries of 2013: the one and only Trivento in Argentina. Jo told you all about their amazing range of benchmark Argentine wines back in October, but in case you missed it, they're the Argentinian branch of legendary Chilean wine brand Concha Y Toro. Jo was blown away by all of their wines (aptly, as Trivento means 'three winds' in Spanish) but it was the company's malbecs that really made her day. The Trivento Reserve Malbec (£8.99 at Tesco) won a gold medal at the International Wine Competition, and it's not just the critics it pleases - it also has a large following of enthusiastic fans (just take a look at the reviews it gets online...). Full of plum, raspberry and vanilla (from the wine's time in oak), this is the epitome of a winter warmer. It's calling out for you to open it on a cold winter evening in front of the fire with friends. BOTH of these bottles are up for grabs for one lucky reader, and entering is - as ever - just a click or two away. Using the safe and secure Rafflecopter widget below, simply 'like' Vinspire's Facebook page, follow @VinspireUK on Twitter, tweet about our lovely Wednesday giveaway, or leave a comment at the end of this blog post saying when/where/with what food you're looking forward to drinking some Trivento Malbec. You have until midnight tonight to enter, and the winner will be announced in tomorrow's giveaway post! Who won those beautiful hand-painted martini glasses yesterday? It was Nicola Lester, so let's all give her a big clap! Check your inbox, you have mail! The Small Print: This giveaway is only open to UK residents, and entrants must be aged 18 or over (sorry, but we will have to verify your age before sending your prize.) The giveaway closes at midnight tonight and late entries will not be accepted under any circumstances. Multiple entries (e.g. tweeting about the competition more than once) will be discounted and the entrant will be disqualified. These wines were donated to Vinspire by the lovely guys at Trivento - unfortunately, none of the Vinspire team is eligible to win the prize. Not even Jo. The winner will be announced in tomorrow's giveaway post and has 24 hours to come forward, or we'll give the prize to someone else (sorry!) If you have any questions, feel free to email us. Malbec is my favourite red! I'd love to drink Trivento Malbec with venison & roast vegetables on Xmas day, at home with my family - heaven! Malbec is the best red wine by far! We are having beef rib for Christmas dinner. The Malbec would be a perfect match. Malbec with the cheese board is a must.... I have some cracking homemade Quince Membrillo to add to it which will only enhance the entire experience...REEM!